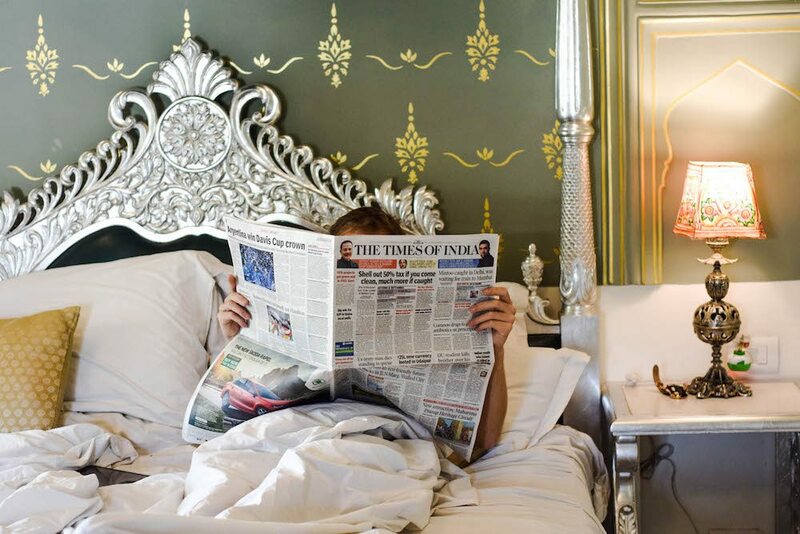 Jaipur offers a large variety of hotels and guesthouses, which of course can make it hard to decide where to stay. We eventually decided to stay at the Pearl Palace Heritage Boutique Hotel. This hotel is one of a kind with it’s hand-crafted artwork in the passageways and amazing details in each room. Once you step into the hotel you’ll be impressed by the lobby, and each room has it’s own individual theme. Best part is that it’s super luxurious, but also really affordable. For less than 40 euros you already have a room! We were extremely lucky to be able to test out one of their rooms, and take a quick peek at two other rooms. For more information read on, as in this post we review Pearl Palace Heritage Boutique Hotel! From the moment that Uber dropped us off at the main entrance of the hotel, we were completely sold. But then we set foot in the hotel and it only got better. 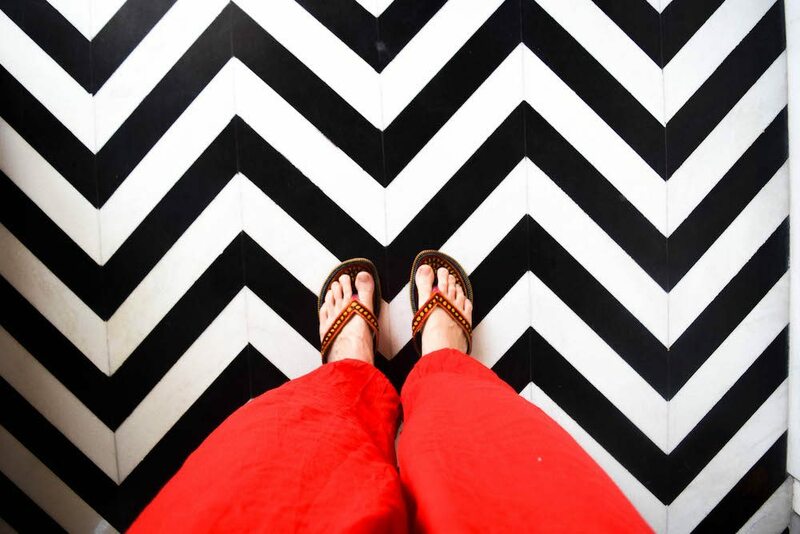 Every inch of this hotel is covered in gorgeous artwork: the walls, the floor, the ceiling. We found it hard to decide where to look. Now that I’m writing this blogpost, I’m actually regretting not taking more photos to show you every single part of this hotel. Once you see the lobby, you just want to see more of the hotel. There are so many detailed decorations, framed photos and paintings. We also loved the marmer floor and little statues of elephants that were placed next to the stairs, as you can see on the right photo above. 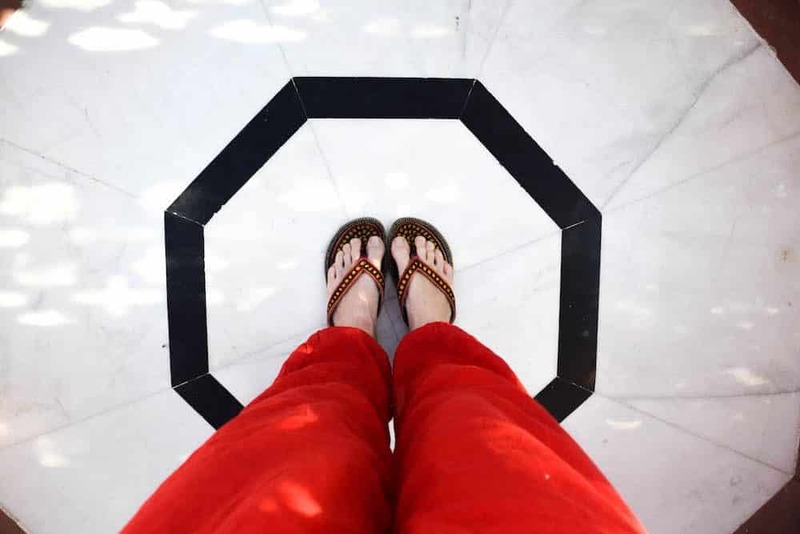 The passageways where the rooms are located are decorated with stone carvings, which gives you the feeling you are actually walking through a holy temple. It’s a bit dark, but that adds to the magical vibe. Every hall way is different, with different wall decorations and carvings. This hotel offers nine different rooms and each of them has a different theme and their own story. Our room was called the Khwabgah Suite, which is decorated in the style of the Khwabgah, also known as Dream Palace. The whole room is inspired by the beautiful building of the royal complex and was for the personal use of the emperor. The real Khwabgah bedroom, known as Khilwatkada-i-Khas, was surrounded by a pillared veranda with a stone-tiled roof. It was connected to the imperial harem and Panch Mahal via a covered passage. This suite recreates that dream-like luxury, making you feel like royalty, yet without the secret harem. The interior of the Khwabgah Suite is amazing. We even had our own little fountain and balcony. The kingsize bed looks as if it’s made for a king and queen. There are so many details in the room, from the floor to the ceiling. Even the bathroom was very unique, with beautiful stained glass and decorated walls. 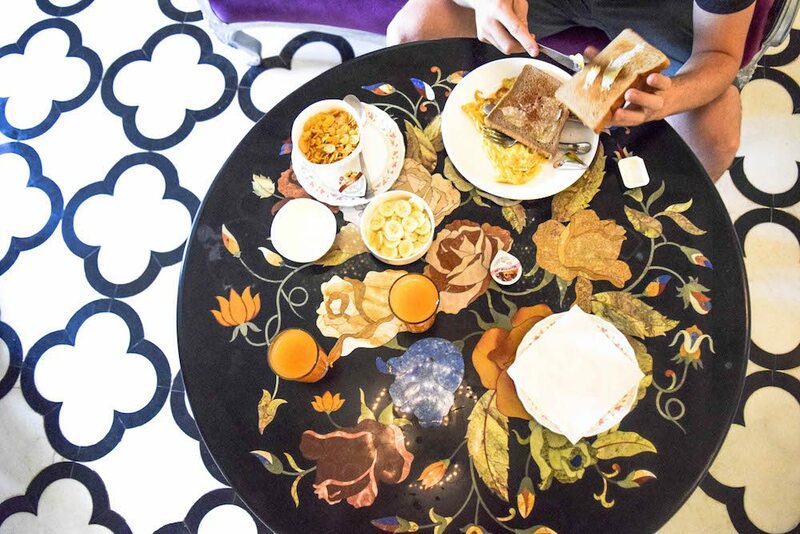 Because we actually didn’t want to leave our room, we ordered room service for breakfast. They have a menu in the room, and a wide variety of choices varying between eggs and muesli with fruit. It was sooo good! The hotel was fully booked. However, because there were two late-check ins we could these out. One of the rooms we could check out was the Nirvana Suite. This impressive suite is decorated with sculptures to honor Buddha, and inspired by Ladakh “Land of High Passses”, which is a region in the state of Jammu and Kashmir. big artwork. 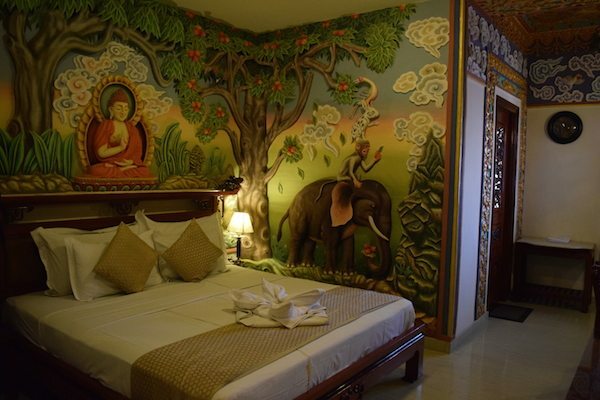 The walls are completely adorned with different carvings, wall paintings and motifs. Buddha is certainly the center in the whole room, as he is proudly displayed above the bed frame. This was also such an impressive room! It’s inspired by many parts of the City Palace Museum in Udaipur. To give the feel of this art work to you, Pearl Heritage Palace had artisans from Udaipur decorate this room. The whole room has a blue light, and on the ceiling there are perfect shaped hand cut pieces of mirror, creating a beautiful mosaic. On the ceiling there is blue lamps, creating the blue color in the whole room. This hotel has six other rooms, namely: the Madhubani room, Jaisalmer Suite, Kutch Room, Jaisalmer Room, Indus Suite and Viceroy Suite. Each and every one of them has their own theme and fitting story. Be sure to check them all out at the website of Pearl Palace Heritage. Of course we also had to try out their amazing restaurant, which is on top of one of their “sister” hotels nearby. It’s actually the number two of the top 10 best restaurants in Jaipur according on TripAdvisor. The food was delicious. It probably was the best dinner we had in a long time. I had the curry with shrimp and Jeffrey had the tandoori platter. For dessert we shared, or maybe I ate it all, a brownie with ice-cream. They don’t serve alcohol, but they serve some pretty awesome mocktails. The fairylights all over the place give the restaurant a great vibe. There was a three-man band playing traditional Indian music, which was the finishing touch. We absolutely loved it. 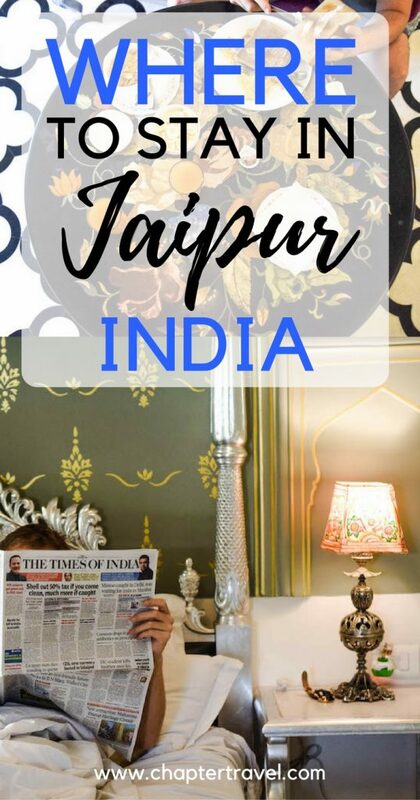 If you’re planning on going to Jaipur, look no further and go to this romantic and gorgeous boutique hotel. It has won TripAdvisors Travellers’ choice award in 2017 and previously was named #1 most Romantic Hotel in India. Just read the reviews on TripAdvisor here. Best of all is that it’s not even expensive. Really. The prices vary between 2800 and 2990 rupees (+9% tax) per night, which is less than 40 USD $/€ per night. 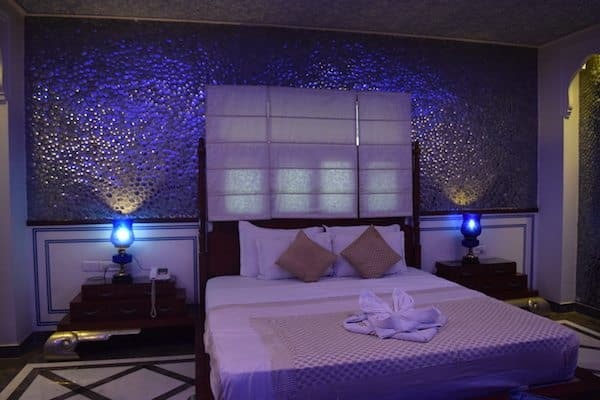 Even though the hotel isn’t expensive, you will feel like royalty because of the beauty of the rooms, and you will get treated like royalty by the staff members. We want to give special thanks to Paresh, who was behind the reception during our stay, as he was truly the friendliest person we have met in India so far. 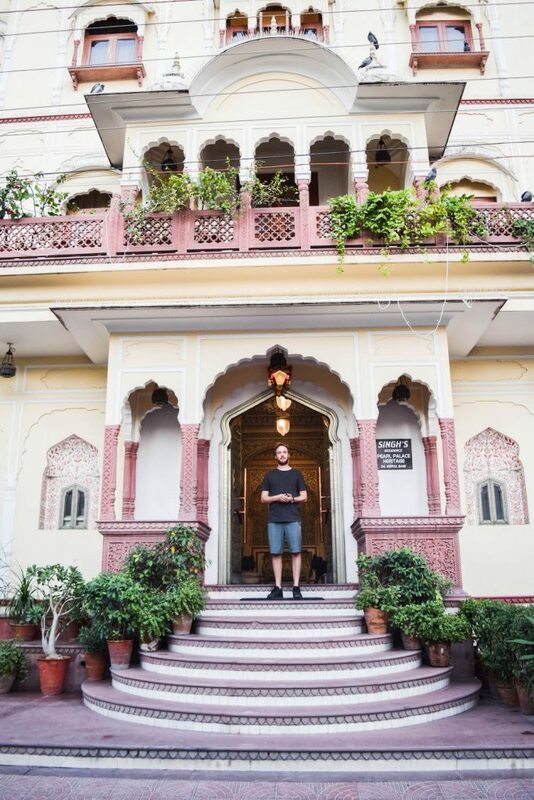 If you’re going to Jaipur, trust me, book a room in this hotel for at least one night just to experience it. Otherwise, at least have dinner at their amazing rooftop restaurant and book up front. It’s usually busy!